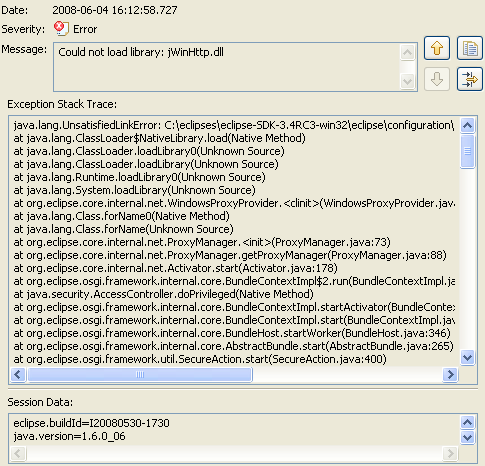 The Error Log view captures all the warnings and errors logged by plug-ins. The underlying log file is a .log file stored in the .metadata subdirectory of the workspace. The Error Log view is available under Window > Show View > Error Log . Events in the log view can be sorted by Message, Plug-in ID or Date in ascending or descending order. Simply click on the column header that you want the sorting to be based on. The down arrow in the column header indicates descending order; while, the up arrow indicates an ascending order. Events in the log view can be grouped by Session or Plug-in ID. Simply click on the chevron from the view's toolbar and select Group By. You can filter the view to show events of a particular type or session. Also, you can limit the number of entries in the view. Filtering options are available under Filters... from the view's toolbar drop down menu. To import an arbitrary .log file into the view, press the Import Log toolbar button or select Import Log... from the context menu. Then, choose a .log file from the file system. To export the current log view content into a file, press the Export Log toolbar button or select Export Log... from the context menu. Then, enter a file name. To clear the view log content without deleting the underlying .log file, press the Clear Log toolbar button or select Clear Log Viewer from the context menu. To permanently delete the underlying .log file, press the Delete Log toolbar button or select Delete Log from the context menu. Full details about a particular event can be viewed in the Event Details dialog by double-clicking on a particular entry or selecting Event Details from the context menu of that entry. You can view the Date, Severity, Message, Exception Stack Trace (if available) and Session Data of each event. You can navigate from one entry to the next via the Up and Down arrow buttons. To copy the error to the clipboard, press the button with the clipboard image.